Matheny student Shane Szott as the cowardly lion. 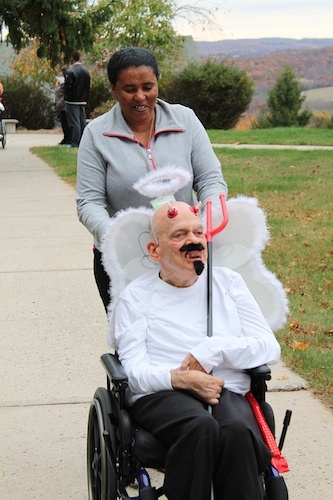 The weather was a little chilly, but that didn’t diminish the spirits of those participating in the Halloween parade at Matheny. 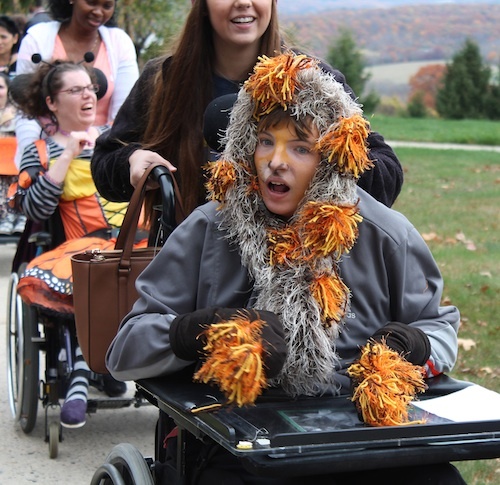 Halloween is a day highly anticipated by Matheny students and patients. And it’s also a day when many family members visit and dress up themselves or just push their sons, daughters or siblings in the parade. In the morning, everyone was invited to visit the Haunted House, designed and built by therapists and members of the Matheny School faculty. The day’s activities were all coordinated by our recreation therapy department, which did a scarily super job. Throughout the year, this department provides a variety of recreation opportunities and resources to improve students’ and patients’ physical, emotional, cognitive and social well-being. Chuck Matheny, half devil, half angel, with personal care assistant Elfinesh Wondafrosh.